Mark Haub, professor, has accepted the position of department head of the food, nutrition, dietetics and health department in the College of Human Ecology. Haub was selected after a nationwide search and previously served as the interim department head. "I look forward to working with my faculty and staff to advance our mission, educate students and Kansans, and conduct quality research," Haub said. "I am truly pleased with what we accomplished this past year with the great people we have working together to strengthen our department and I am eager for the work we have ahead of us." In addition to teaching and research in human nutrition, Haub is on the faculty of the Food Science Institute and is a faculty affiliate in gerontology and the master's of public health program. 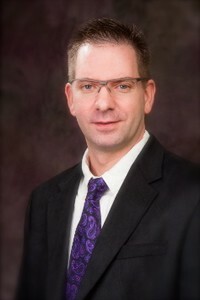 Haub also is a scientist with the Johnson Cancer Research Center at K-State. His current research investigates the effect of eating whole grain and dietary fiber on metabolic outcomes, including obesity and diabetes. "The Department of Food, Nutrition, Dietetics and Health has flourished under Dr. Haub's recent leadership," said John Buckwalter, dean of the College of Human Ecology. "He has been an integral part of the transition to bring dietetics into the department and ensures that students receive opportunities for exceptional experiences and faculty have opportunities to engage in innovative research. In Dr. Haub's roles as educator, researcher and administrator, his dedication to faculty and students is obvious and will continue to serve him well as department head." Haub joined K-State in 2000 and has a master's degree in exercise science and a doctoral degree in exercise physiology from the University of Kansas. He completed a postdoctoral fellowship in the geriatrics department at the University of Arkansas for Medical Sciences. He also has served on K-State's faculty senate. Food, nutrition, dietetics and health offers undergraduate degrees in nutritional sciences, nutrition and kinesiology, dietetics, public health nutrition and athletic training; a concurrent bachelor's and master's degrees in nutrition, dietetics and sensory sciences; and graduate study in sensory analysis and consumer behavior, nutritional sciences, dietetics, public health nutrition and public health physical activity. Course options are available both on campus and through distance courses. This article was posted on Tuesday, May 31, 2016, and is filed under College News, Food, Nutrition, Dietetics and Health, Sensory Analysis Center.